A number of innovations and improvements to bicycle design came together to make the Ritchey Outback, a capable adventure companion. Road, off road, trail, expedition, you name it, the Outback can do it all. It starts with a fork that can comfortably clear a 700x40c tyre with a surprisingly short axle to crown that improves the handling of the bike by lowering the front ends centre of gravity. From there, choice decisions were made on the location and butting profile of time tested Ritchey Logic steel tubing to create a resilient ride feel over the harshest of terrain. 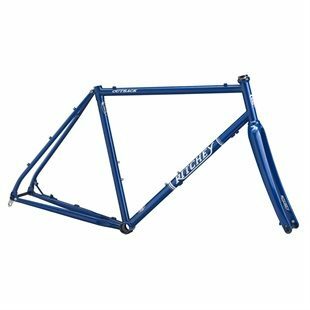 Of course Ritchey frames retain their signature 27.2 seatpost spec and straight steerer so as to not over build a bike in the name of stiffness, because who needs that when there are miles of trail yet to explore? Slap a set of thru-axle Zeta Discs with your favourite tread on the Ritchey Outback and you are ready to roll on a bike that's built to take on any and everything that stands in its way.